To arrange for hematology, serum chemistry, and coagulation services, contact the lab via email to set an appointment and receive instructions for the shipping and handling of samples. Additional Services: Platelet aggregometry and additional serum chemistry analyses are also available. Inquire for prices and methods. HEMATOLOGY special consideration: This service is only available locally (San Diego County), as samples are only viable 4 hours after collection. Overnight shipping of samples will not be accepted. Same mouse, multiple survival bleeds: may be taken over regularly spaced intervals to allow the mouse to recover. Serum is prepared after each bleed, stored, and later pooled once sufficient. Same mouse group: matched for age, gender, genotype, and treatment conditions. It is not recommended to dilute the sample more than 1:2 (100uL DI water to 200uL serum). If over-diluted, levels of interest (e.g. LDLc, Chloride) may not be present at high enough levels to reach the threshold of detection and will produce inaccurate or no results. Fasting - plan accordingly for time of food intake or restriction, prior to sampling, as this may affect results. Needle is inserted to the heart and up to 1mL of blood is withdrawn. Note the volume. Whole blood samples should be collected into tubes with an anticoagulant, preferably EDTA. Samples must be tested within 4 hours of collection to avoid coagulation and to ensure accurate results. Analysis is done using a Hemavet 950FS Multi-Species Hematology System (Drew Scientific, CT) programmed with species-specific (e.g., mouse, monkey, dog) settings. Background checks are run before sample analysis to verify that background counts are within acceptable limits. A mouse control reference is supplied by the manufacturer and is tested each time samples are run for calibration control. Control reference for other species are not kept in stock; contact our lab to discuss ordering. All samples are tested in duplicate (unless otherwise specified) for a Complete Blood Count (CBC) with leukocyte differential, and a Platelet count. Results may be given as individual sample report sheets and/or a cumulative excel file. An unstained whole blood smear is prepared for each sample and is available for reference upon request. Collect blood into a Microtainer Serum Separator Tube(s) (SST, Gold, P/N: BD 365967). Blood is allowed to clot over 4 hours at room temperature. Blood in the SST is then spun for 5 minutes at 7000 rcf. Serum supernatant is removed and placed into a 1.5mL microtube. If not immediately analyzed, serum is aliquoted and frozen at -80°C. Avoid multiple freeze-thaw cycles. Analysis is done using a Cobas 8000 automated chemistry analyzer (Roche) with a general coefficient of variance of <5%. Collect blood into a microtube containing sufficient additional citrate to achieve a final ratio of nine parts whole blood to one part citrate (9:1). Sample is centrifuged twice at 2000 rcf for 15 min at 22°C. Plasma is drawn off the top, aliquoted, and frozen at -80°C within two hours of puncture. Avoid multiple freeze-thaw cycles. Analysis varies by assay, please see details below. 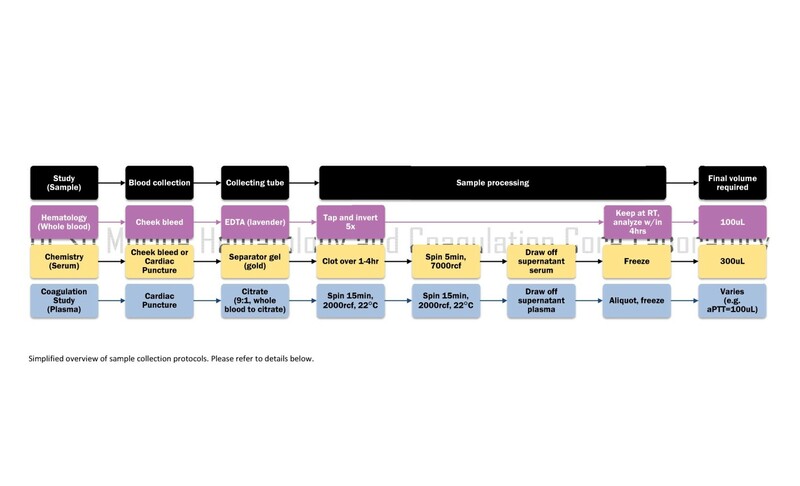 Measures the time to clot formation, indicating the activity of the extrinsic and common coagulation pathways and their involved clotting factors. Measures the time to clot formation, indicating the activity of the intrinsic and common coagulation pathways and their involved clotting factors. Key coagulation factor of the intrinsic pathway; activity levels are based on correction of clotting time for plasma deficient of the factor of interest and is reported as a percent. Follow the factor VIII method, using plasma deficient of the specific factor being measured in place of factor VIII‡ deficient plasma. Key coagulation factor of the extrinsic and common pathway; activity levels are based on correction of clotting time for plasma deficient of the factor of interest and is reported as a percent. Follow factor VII method, using plasma deficient of the specific factor being measured in place of factor VII§ deficient plasma. Activity of fibrinogen, activated by thrombin, is measured in time to clot formation. Antithrombin activity is measured by level of inhibition of Factor Xa. Measured by the level of chromogenic substrate cleaved by activated protein C.
Protein S antigen is detected by binding to an antibody, then secondary binding by a conjugated antibody that will produce a detectable color change with the addition of a substrate. Activity is measured by the level of chromogenic substrate cleaved by plasmin or urokinase-activated plasminogen. Antiplasmin activity is measured by level of inhibition of plasmin. vonWillebrand Factor antigen is detected by binding to an antibody, then secondary binding by a conjugated antibody that will produce a detectable color change with the addition of a substrate.